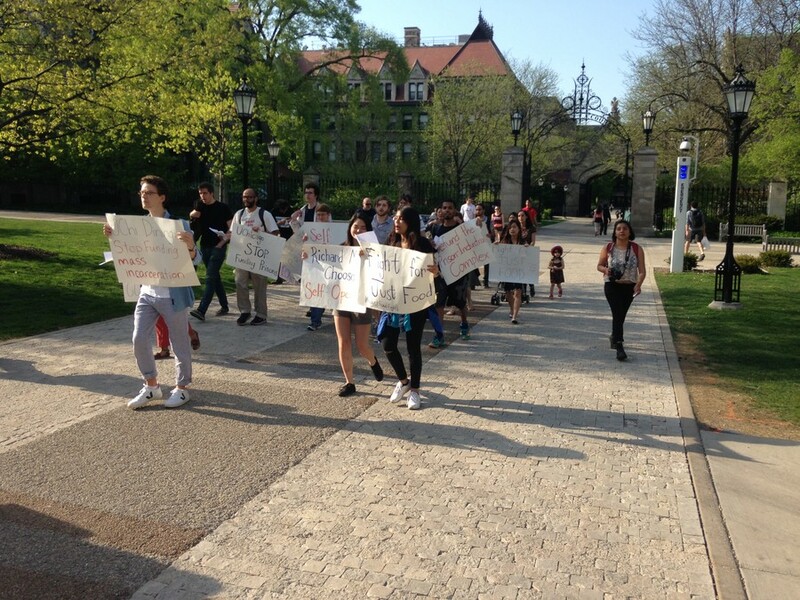 Activists argue that the University financially supports mass incarceration. Fight for Just Food holds a rally on May 6. Student activists held a 24-hour hunger strike and rally last week to protest what they see as the University’s complicity in mass incarceration through its choice of dining providers. According to the Fight for Just Food (FJF), the student group that organized the protest, by contracting with dining services companies that profit from providing services to prisons, the University supports mass incarceration and other abuses of the criminal justice system. Bon Appétit Management Company, which recently received the contract to provide dining services at the University, only works with private colleges, museums and cultural centers, and corporations. In a statement it released to The Maroon in response to the hunger strike, Bon Appétit said that it has never provided food services to prisons. Bon Appétit is owned by Compass Group, the world’s largest food services contractor, and other companies owned by Compass Group do work in correctional institutions. The rally and hunger strike came a little more than a week after the University announced it would end its decades-long relationship with Aramark as campus dining provider in favor of Bon Appétit. FJF had previously indicated that it would not be satisfied by any of the three companies that bid to become the University’s dining contractor, since Sodexo, Aramark, and Compass Group all have some corporate affiliation with prisons. FJF instead advocates self-operation, managing dining entirely in-house. According to head of UChicago Dining Richard Mason, the University will not consider dining contractors’ relationships with correctional facilities because of the Kalven Report, a university document that generally prohibits the consideration of political questions when making institutional decisions. In a meeting with The Maroon earlier this year, Mason said that the University had considered self-operation, but had decided, at least for the time being, that it made more sense to continue relying on companies that specialized in dining services. The 10 participating students began their hunger strike Thursday afternoon. Before the strike, a series of posts on FJF’s Facebook page gave individual activists’ reasons for striking. “I am hunger striking because the University needs to listen to its students. Large food service corporations that serve prisons benefit from mass incarceration. The University of Chicago needs to take a stand against our corrupt criminal justice system and move toward self-operation,” first-year Claire Hagerty wrote in her post. At Friday’s rally, held around 24 hours after the hunger strike began, FJF hosted several guest speakers who had spent time in prison. The speakers reflected on the conditions they had experienced and praised FJF’s protest. “I did my crime, I deserved to go to jail. I didn’t deserve to be tortured. The food they allegedly serve is not food, in prison. It’s soy, it’s garbage that’s made into a little pattie that they say is food,” said Brian Nelson, who spent years in solitary confinement and now works with the Uptown People’s Law Center. Roughly 30 protesters met outside of Bartlett Dining Hall and then marched to Levi Hall, the University’s administrative hub. “Prisons profit off our tuition—how about prison abolition? This food funds prison labor—this is not a taste we savor. It’s a moral obligation to choose self-operation,” protesters chanted as they walked. Once the protesters arrived at Levi they chalked messages on the stairs and the side of the building. A few minutes later, sandwiches provided by FJF arrived, and protesters broke their hunger strike.